Some may have noticed it in Cambridge already… there’s been a Kiwi presence in some bars, with beers from New Zealand sneaking onto taps across the city. But this isn’t just beer on a holiday – this is a full on KIWI INVASION. And in the front ranks are the Yeastie Boys super-hopsters. Since last October they have been infiltrating the UK from the sea – reaching our shores after a long voyage from the opposite side of the planet. Creeping into our bars… skulking in our cellars… ready to LEAP OUT, rip across our tastes buds and punch down our throats. Delivering enjoyment and flavour to British beer lovers. It’s the best kind of invasion there is. Our next “Meet the Brewer” event is a doozy… we will have Yeastie Boys Stu in town to talk Kiwi beer! WHEN: Thursday July 2nd from 6pm. HOW-MUCH: Non-ticketed, show up when you can, hang out… buy beers from the bar. Gunnamatta – 6.5% – Earl Grey tea infused IPA, totally the awesomesauce. Pot Kettle Black – 6.0% – South Pacific Porter, well hopped velvety dark lusciousness. Stairdancer – 4.4% – Pacific Ale, crisp dry Nelson Sauvin quaffing juice. 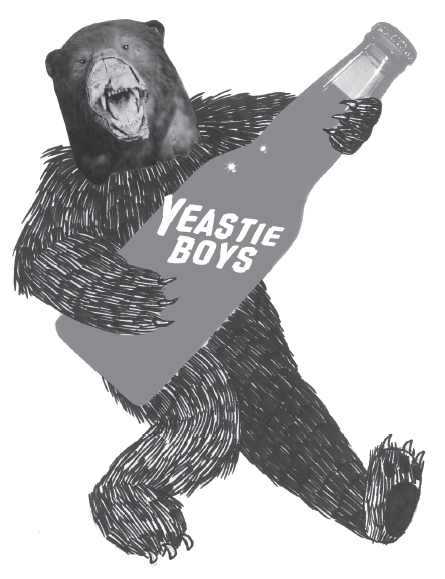 This is a simple non-ticketed general beery love-in… so just show up on the night, enjoy some Yeastie Boys brews, and chat beer. We may also line up a special tasting session on the side once we’ve worked out what our bottle stocks permit… pop along to the Facebook event page and let us know you’re coming. Since last October Jolly Good Beer has been working to get imports from New Zealand out and about amongst the pubs, bars, and bottle-shops of our region. And they’ve been well received too… each order of Kiwi beer is bigger than the last. The New Zealand Craft Beer Collective was formed to export some of the cream of the NZ beer crop and fully launched in the UK at the start of 2015. Every couple of months a full refrigerated container of chilled Kiwi goodness is shipped our way, and from the importer our small part of this is delivered directly to our own coldstore. It’s a chain of supply that guarantees even the crisp pale goodies full of Kiwi hops last the journey to still taste awesome in UK bars. This entry was posted in Meet The Brewer and tagged Blue Moon, Cambridge, Kiwi Beer, New Zealand, Yeastie Boys. Bookmark the permalink.